President Donald Trump delivered his first formal State of the Union address on Tuesday evening. Below are eight key moments from his speech. 1) Trump declared "a new American moment" was upon the country, thanks to a booming economy, bolstered by the Republican tax reform law, a low unemployment rate, and high consumer confidence. "This is our new American moment," the president said. "There has never been a better time to start living the American dream. So to every citizen watching at home tonight—no matter where you have been, or where you come from, this is your time. If you work hard, if you believe in yourself, if you believe in America, then you can dream anything, you can be anything, and together, we can achieve anything." 2) The president called on Americans to stand for the national anthem while honoring Preston Sharp, a 12-year-old California boy who has organized the placement of more than 40,000 flags and carnations on the graves of U.S. soldiers. "Young patriots like Preston teach all of us about our civic duty as Americans," Trump said. "Preston's reverence for those who have served our nation reminds us why we salute our flag, why we put our hands on our hearts for the pledge of allegiance, and why we proudly stand for the national anthem." 3) Trump, who ran as the candidate of "law and order" during the 2016 presidential campaign, embraced the cause of prison reform during his speech. "As America regains its strength, this opportunity must be extended to all citizens," the president said. "That is why this year we will embark on reforming our prisons to help former inmates who have served their time get a second chance." The president's remarks are not totally unexpected, as he has filled his Cabinet with past advocates of criminal-justice reform like Secretary of Energy Rick Perry and United Nations Ambassador Nikki Haley. Earlier this month, Trump held a listening session at the White House on prison reform, which came after Trump's senior adviser and son-in-law, Jared Kushner, held a roundtable on the same topic in September. 4) Trump touched on numerous policy topics during his address: the opioid epidemic, paid family leave, the price of prescription drugs, infrastructure, and trade, among others. Yet no single issue took up more of his speech than immigration reform. Through four clearly defined pillars, the president unveiled his immigration reform package. The policies he outlined varied from granting a "path to citizenship the 1.8 million illegal immigrants brought" to the U.S. as children, to ending chain migration, building a wall on the southern border, and ending the visa lottery system in favor of a merit-based immigration system. Immigration has been a contentious issue for the Trump administration over the past year. In early January, Senate Democrats refused to support a spending bill to fund the federal government because it did not include a long-term fix to the Obama-era Deferred Action for Childhood Arrivals program, which provides legal protections to immigrants who were brought to the U.S. illegally as children. 5) The president used Tuesday night's speech to announce his decision to sign an executive order asking Secretary of Defense James Mattis to reexamine the country's military detention policy and keep the Guantanamo Bay military prison open. "Terrorists who do things like place bombs in civilian hospitals are evil. When possible, we annihilate them. When necessary, we must be able to detain and question them," Trump said. "But we must be clear: Terrorists are not merely criminals. They are unlawful enemy combatants. And when captured overseas, they should be treated like the terrorists they are." 6) Trump also reaffirmed his administration's commitment to fighting the opioid crisis, telling the story of a New Mexico police officer who, along with his wife, decided to adopt the child of a pregnant heroin addict who he encountered while on duty. "Last year, Ryan was on duty when he saw a pregnant, homeless woman preparing to inject heroin," Trump said. "When Ryan told her she was going to harm her unborn child, she began to weep. She told him she did not know where to turn, but badly wanted a safe home for her baby." "In that moment," Trump continued, "Ryan said he felt God speak to him: ‘You will do it, because you can.' He took out a picture of his wife and their four kids. Then, he went home to tell his wife Rebecca. In an instant, she agreed to adopt. The Holets named their new daughter Hope. Ryan and Rebecca: You embody the goodness of our nation. Thank you, and congratulations." 7) The president also showed that destroying the criminal gang MS-13 continues to be a focus of the White House amid the ongoing conversation surrounding immigration reform. The president brought the parents of two girls killed by MS-13 gang members to the State of the Union as his personal guests. While telling their story, Trump called on Congress to close loopholes to prevent similar tragedies from occurring in the future. "Tonight, I am calling on the Congress to finally close the deadly loopholes that have allowed MS-13, and other criminals, to break into our country," he said. "We have proposed new legislation that will fix our immigration laws, and support our ICE and Border Patrol agents, so that this cannot ever happen again." 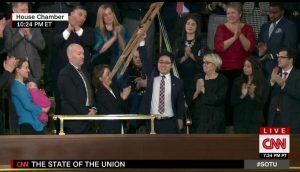 8) Toward the end of Trump's address, Ji Seong-ho, while receiving a standing ovation, held up the crutches that were vital to his escape from North Korea in a moment symbolizing the triumph of freedom against the forces of authoritarianism. Ji Seong-ho at the State of the Union. Ji Seong-ho, who lost his leg while attempting to steal a piece of coal in an effort to ward off starvation, was tortured by the North Korean regime before escaping the country on foot. He is now a vocal critic of the regime and runs an organization that helps support and rescue other defectors. This entry was posted in Politics and tagged Donald Trump, Immigration Reform, MS-13, National Anthem, North Korea, Prison, State of the Union. Bookmark the permalink.